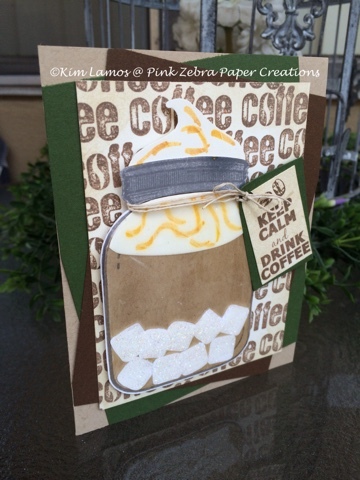 Pink Zebra Paper Creations: Iced Coffee! Today I am participating in a summer blog hop with www.coffeelovingcardmakers.com. The theme is coffee, tea or cocoa. I knew exactly what I was going to do, Iced Coffee! I love some iced coffee with caramel on top on a hot summer morning! Enjoy! Fun card! Love the great color! What a fun card, Kim, love the thought of starting my day with your caramel creation! Happy hopping! Love your iced coffee in the jar! Super fun! Love your card, that stamped background is precious! Love the color scheme of this cute card. really cute!!! love those browns together!! That sentiment makes me giggle as I think of how jittery one gets with a too much coffee! tee hee! Fab!! OOoohhhh that's inky and fabulous! Love the word-art background! sitting here drinking my own iced coffee and loving your card! Yes iced coffee! Such a treat...and so is your card! What a fab coffee card! I love the background you have created and the coffee cup is perfect!! This is awesome! What a fun image and great sentiment! A fun iced coffee caramel creation! How cute is this? Fun! Fabulous coffee card, just for summer! Great job! sign me up, that looks delicious! Love this! I love that "keep calm and drink coffee". I need a sign like that. Oh this is so fabulous, I love it. Great and sweet project!! TFS! !